By the middle of the 18th Century, the power of France had been extended over a great part of North America. 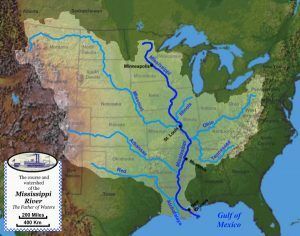 The first efforts toward the settlement of the Mississippi Valley were made by the French at several of its remotest points on the Great Lakes, on the Wabash River, at Kaskaskia, Illinois, and on the Mississippi River, where their settlements extended across the Mississippi to St. Genevieve, and St. Louis in present-day Missouri; on the Mexican Gulf, at Biloxi, Mississippi and Mobile, Alabama; and on the Lower Mississippi River, at New Orleans, Louisiana. In pursuit of their great plan of occupying the whole valley and connecting their settlements from Canada to the Gulf of Mexico by a line of posts, with water communications, like the chord of an immense semicircle, they stretched along the whole rear of the English settlements. Gradually, they extended their fortifications to the south side of Lake Erie; erecting one at Presque Isle, near present-day Erie, Pennsylvania, and another at Le Boeuf, on the French Creek, in northwest Pennsylvania, and a third on the Duquesne River, at the junction of the Alleghany and Monongahela Rivers, on the site of present-day Pittsburgh, Pennsylvania. The advantages of that admirable position did not escape the eyes of a people remarkably acute to discern the advantages of military posts. By it, they proposed to command the trade, and awe the obedience of the Indians of the Ohio River and the Great Lakes, and connect the southern Canadian posts, by the long and unrivaled communication of the Ohio River with the settlements of the Wabash, Illinois and lower Mississippi Rivers. The English could not regard these proceedings of their rivals without alarm, seeing that the French were monopolizing the vast and fertile country of Upper Louisiana. They desired to share the advantages, especially as they considered themselves possessing-an equal claim to them. In consequence of the discovery of the Cabots, they asserted the right of extending their settlements as far as the Pacific Ocean. 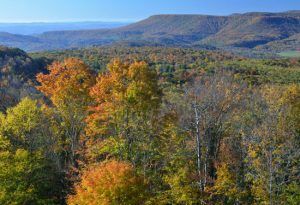 The French, on the other hand, maintained their claim to the Mississippi Valley, on the grounds of having been the first to explore and colonize it, and insisted that the English should confine themselves to the country east of the Alleghany Mountains. Amid these conflicting pretensions, neither party seems to have imagined that there might be prior rights, which equally barred the claims of both. An Indian chief remarked, on the occasion of this dispute, “The French claim all the country to the west, and the English all to the east and west; where, then, is the country of the Indians?” This was an embarrassing question, that was never satisfactorily answered. At this time, however, the Indians did not seem to think of asserting their own rights, but, took part in the quarrels of the two nations, which were both equally regardless of them: a very fortunate circumstance for the French, as Canada then contained only 45,000 inhabitants, and the whole of Louisiana no more than 7,000 whites, while the English colonies had a population of over a million. The rival nations now only waited for an occasion of commencing the contest, and it soon arrived. Before long, several individuals in Virginia and England associated together under the name of the Ohio Company, and obtained a grant from the crown of 600,000 acres of land, lying in the country claimed by both England and France. The objectives of this company were commercial as well as territorial, and measures were taken for securing all the advantages which could be derived from their charter by establishing trading-houses and employing persons to survey the country. The governor of Canada, on receiving information of what he considered an encroachment on the French dominions, wrote to the governors of New York and Pennsylvania, stating that the English traders had trespassed upon French territory, and that, if they were not made to desist, he should be under the necessity of seizing them. Finding his threats disregarded, he proceeded to put them in execution; and, arresting the company’s servants, had them conveyed as prisoners to Presque Isle, on Lake Erie, where he was engaged in erecting a strong fort. About the same time, communication was opened from Presque Isle, along French Creek and the Alleghany River, to the Ohio River. This communication was kept up by detachments of troops posted at proper distances, in works capable of protecting them against an attack made with small arms alone. This military line passing through the territory granted to the Ohio Company, as a part of Virginia, the lieutenant-governor of that province laid the matter before the Assembly, and dispatched George Washington, then a young officer of only 21 years, with a letter to Monsieur de St. Pierre, commander of the French forces on the Ohio River, requiring him to withdraw from the dominions of his Britannic majesty. St. Pierre replied with politeness, but, in decided terms, that he had taken possession of the country by order of his superior officer, Governor Duquesne, to whom he would transmit the letter, but, the summons to retire he could not comply with. In 1754, preparations were immediately made in Virginia to assert the rights of the British crown, and a regiment was sent to the defense of the frontier. 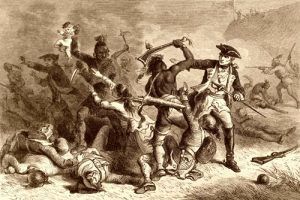 Advancing with a small detachment, George Washington fell in with a party of French and Indians, who approached with every appearance of hostile intentions. A skirmish ensued, in which the commander of the party, Joseph Coulon de Jumonville, and ten of his men were killed. Washington’s objective had been to anticipate the French occupying a post at the junction of the Alleghany and Monongahela Rivers, where a party of militia and workmen had been sent by the Ohio Company. However, Washington and his men found that the French had already driven the men of the Ohio Company away, and erected a strong fort on the spot. 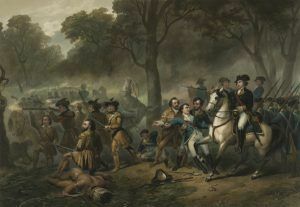 Foreseeing that, on hearing of the affair of Jumonville, the French would at once send a detachment against him, he hastily completed a small stockade he had commenced at a place called Great Meadows, near the site of Uniontown, Pennsylvania, and gave to it the name of Fort Necessity, Pennsylvania. Here, he was soon attacked, and, after a gallant defense, capitulated on honorable terms. This action, being considered by the British government as the commencement of hostilities by the French, troops were immediately sent from England. Among the different expeditions planned was one under General Edward Braddock against Fort Duquesne, on the site of present-day Pittsburgh, Pennsylvania. British Major General Edward Braddock arrived in this country early in 1755 with two regiments of veteran English troops. He was joined at Fort Cumberland, Maryland by a large number of provincial troops to aid in the contemplated reduction of Fort Duquesne, Pennsylvania. Dividing his force, he pushed onward with about 1,200 chosen men through dark forests, and over pathless mountains. Colonel George Washington, who was a volunteer aid of Braddock, but, had been left behind on account of illness, overtook the General on the evening of the July 8th, at the mouth of the Youghiogheny River, 15 miles from Fort Duquesne, the day before the battle. The officers and soldiers were now in the highest spirits, and firm in the conviction that they should, within a few hours, victoriously enter within the walls of Fort Duquesne. Early on the morning of the July 9th, the army passed through the river a little below the mouth of the Youghiogheny River and proceeded in perfect order along the southern margin of the Monongahela River. Washington was often heard to say, during his lifetime, that the most beautiful spectacle he had ever beheld was the display of the British troops on this eventful morning. Every man was neatly dressed in full uniform, the soldiers were arranged in columns, and marched in exact order, the sun gleamed from their burnished arms, the river flowed tranquilly on their right, and the deep forest overshadowed them with solemn grandeur on their left. Officers and men were equally inspirited with cheering hopes, and confident anticipations.